Apparently, TweetMeme is getting big enough that it can have its own “20%” projects, like Google does. 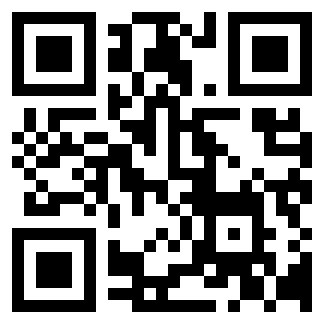 That’s how TweetTabs was born, a great new way to search Twitter in real-time. 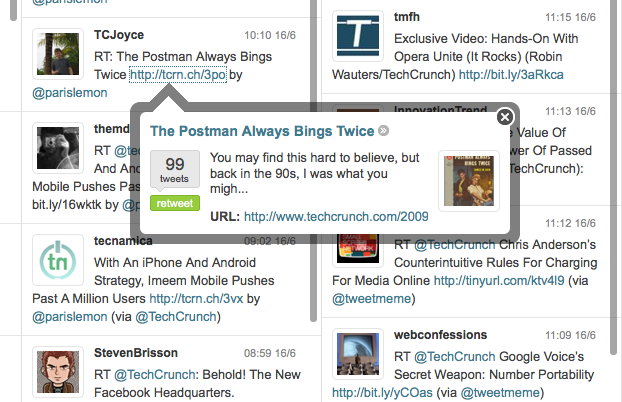 True to its name, TweetTabs allows you to open several tabs with different Twitter search queries. 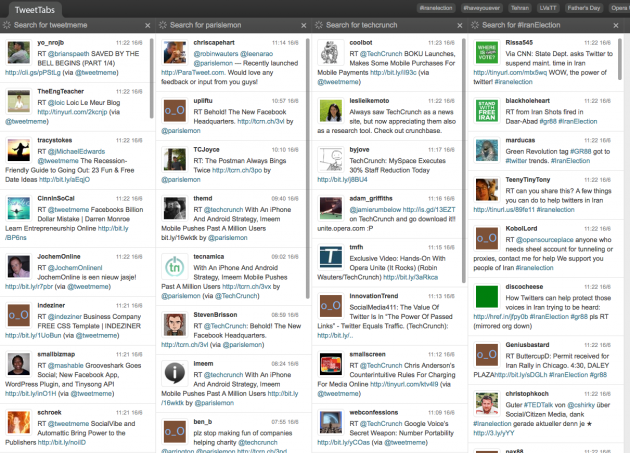 While some Twitter desktop clients also allow you to do this, TweetTabs is completely browser-based. And it’s great because it’s so simple. All you do is enter a query into the search box and a new tab will automatically pop open that will update in real-time. There are also a list of the top trending topics on Twitter across the top of the site, which you can click on to open a tab for any of those searches as well. Another nice feature is that clicking on any link provides an overlay to give you more information about the URL, including a few quick lines from blog posts and a thumbnail of an image used. Naturally, there is also a retweet button here to allow you to easily resend the tweet back to Twitter by way of TweetMeme . Hovering over a Twitter icon in TweetTabs also presents the options to retweet, reply to a tweet, or to see that user’s Twitter profile. 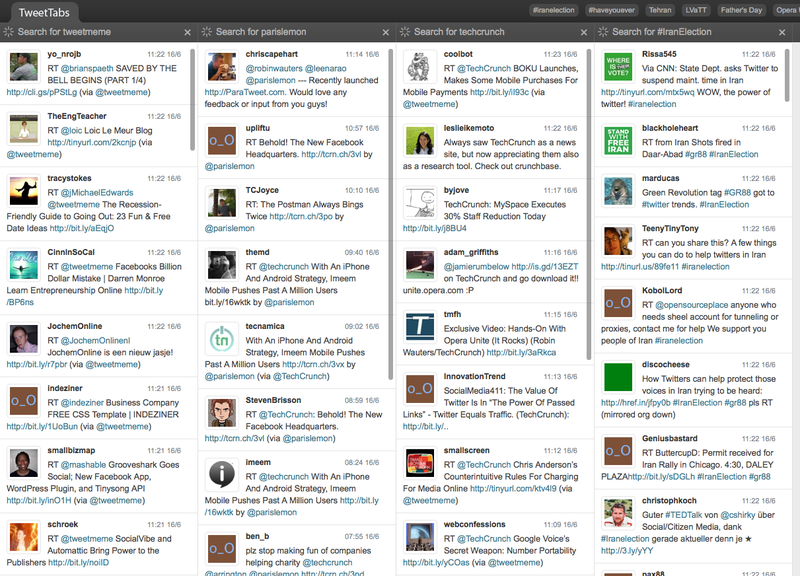 You can drag and drop to change the order of the tabs, and if you close the window, TweetTabs will remember which searches you had opened. Unfortunately, I think the API may be limiting the full real-time aspect of the service. Tweets about Iran, for example, start flowing quickly but then seem to hang for a while. If they can get that resolved though, this may be the ultimate web-based Twitter search tool. TweetTabs is just the first of a range of “complimentary” Twitter-based services TweetMeme founder Nick Halstead plans to launch over the next several months, he says.